How Do Israelis Elect Their Leaders? Israelis 18 years and older will vote in elections for the Knesset, the 120-seat unicameral legislative body, on Tuesday. Ballots are cast not for candidates but for political parties, whose members receive seats on a proportional basis and serve for up to four-year terms. It is rare that an Israeli government makes it through all four years. A party must receive at least 2 percent of the vote to receive seats. The prime minister, who serves as head of government, is usually but not always the leader of the party which wins the most seats (in 2009, Kadima won the most votes in the election but was unable to build a coalition). He or she is tasked with building a coalition government and Cabinet from allied parties. The Cabinet serves as the executive branch of the Israeli government. The president is elected by the Knesset for a seven-year term, but it is largely a ceremonial role. The last parliamentary election was on Feb. 10, 2009, which produced the 18th Knesset with Likud candidate Benjamin Netanyahu, who led the second largest party as prime minister. There were 14 parties represented in the 18th Knesset — 12 were voted in and two new parties were formed through party divisions. Elections for the 19th Knesset were scheduled to take place in October 2013, but the Knesset and the prime minister retain the power to dissolve the Knesset and hold elections early. This usually happens when the government is having difficulty holding together a coalition or if it cannot pass a budget. The Israeli Knesset often is dissolved by a vote of no confidence. Netanyahu cited the budget stalemate as the reason for holding early elections, but it is widely believed that he wanted to hold elections before the Knesset would have had to pass an unpopular austerity budget and before the opposition had time to organize and rally support. Thirty-four parties are contending in the Jan. 22 election, which is overseen by a Central Election Committee comprised of current Knesset representatives and led by a Supreme Court Justice. Starting at 8 a.m. Tuesday, Israelis can go to the polls to select one party. There is no absentee voting except for Israelis on official duty in the foreign service. Turnout among the general population of Israelis is generally about 65 percent, although turnout is lower among Arab Israelis at 50 percent, according to a Haifa University poll. Polls close at 10 p.m., and by midnight results are usually known. Once results of the parliamentary election come in, Israeli President Shimon Peres will select a prime minister who he believes has the best chance of forming a new coalition government. The prime minister has four weeks to build this coalition, with a two-week extension period after that. Within this time, the prime minister builds alliances with other parties and decides the Cabinet, ministerial positions and policy. The existing government continues to govern in this time, and only when the Knesset approves the new coalition government does it take over. The current coalition government is comprised of Prime Minister Benjamin Netanyahu’s Likud party along with Yisrael Beiteinu, Habayit Hayehudi, Shas, and United Torah Judaism. These parties represent right-wing interests such as a hawkish approach to security and Palestinian relations, fiscal conservativism, conservation of territory and settlements in the West Bank, and the conservative religious agenda. The left has not been successful in attempts to join with more centrist parties to form an alternative bloc to challenge Netanyahu. It’s likely that Netanyahu’s new coalition will include Habayit Hayehudi and Shas, both part of the current coalition. He could reshuffle and replace United Torah Judaism with Kadima, Hatnuah, or Yesh Atid, the newly created center-secular party. Likud is expected to win the most seats, but it has not performed as strongly in polls compared to previous elections. This could lead smaller right-wing and ultra-Orthodox parties to exert greater influence as they prop up the Likud/Yisrael Beiteinu coalition. The difficulty of maintaining a broad and stable coalition means that small groups with very specific agendas not supported by a wide swath of the electorate can exert undue pressure on more centrist groups. The next presidential election will take place in 2014. If the body is not dissolved before, the next Knesset election is scheduled for 2017. According to a recent poll by Haaretz, 48 percent of voters claim socioeconomic issues as their No. 1 factor in determining their vote, followed by 18 percent who say its the “Palestinian issue” and 12 percent who are more influenced by the ultra-Orthodox draft debate (whether or not the currently exempted group should be forced to be included in Israel’s mandatory military service). 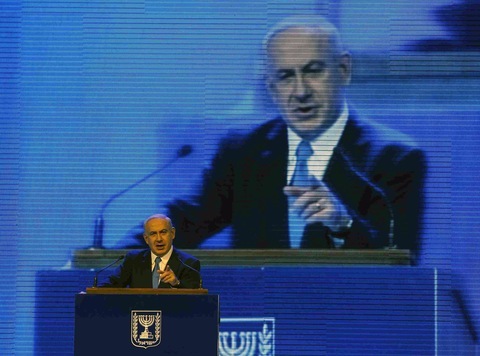 Israeli Prime Minister Benjamin Netanyahu speaks during the launch of his Likud Beiteinu party campaign in Jerusalem on Dec. 25. Photo by Ronen Zvulun/Reuters. Likud/Yisrael Beiteinu (Government): Likud, led by Prime Minister Benjamin Netanyahu, has joined with Avigdor Lieberman’s Yisrael Beiteinu to form a right-wing block with a hawkish approach to security issues. Netanyahu has billed himself as the only leader strong enough to deter Iran, although many Israelis became concerned with his diplomacy skills because of his strained relationship with President Obama. The party takes a tough approach to Palestinian negotiations but accepts the two-state solution. It also promotes fiscal conservativism. Likud currently holds 27 Knesset seats, but it is expected to pick up more now that it is running with Yisrael Beiteinu. Leadership: Benjamin Netanyahu, who has served as prime minister since 2009. He was also prime minister from 1996 to 1999. He was an elite commando in the army and rose to public prominence as Israel’s ambassador to the United Nations. Avigdor Lieberman leads Yisrael Beiteinu. He has wide support among Israelis from the former Soviet Union but may not reenter the Knesset because of fraud charges. Naftali Bennett, head of the Beit Yehudi (Jewish Home) party, campaigns at a bar in the southern city of Ashdod on Dec. 27. Photo by Amir Cohen/Reuters. Habayit Hayehudi (Government): This religious, right-wing party — known in English as the “Jewish Home” party — emerged from the alliance of the National Religious Party and the National Union. While rebranded, it had a weak showing in the 2009, only winning three seats. 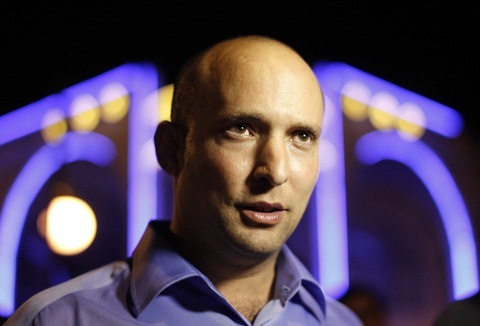 Its new leader, the young and dynamic Naftali Bennett, has brought new energy to the party and siphoned potential voters away from Netanyahu’s Likud. The party supports settlements throughout the West Bank and opposing the Oslo Peace Accords. Bennett has proposed annexing certain areas of the West Bank and granting Israeli citizenship to Palestinians there. It now holds three Knesset seats. Leadership: Naftali Bennett, a 40-year-old former special forces officer who became a millionaire in the tech industry, revived the party after a series of changes and rebranding. He served as Netanyahu’s chief of staff before the two had a falling out. His social-media prowess has brought the party new popularity as it recruits young right-wing members. United Torah Judaism (Government): United Torah Judaism (UTJ) is a coalition of different segments of the ultra-Orthodox Ashkenazi (Jews of European descent) community. Two of the main groups represented are Hasidic Jews (Agudath Yisrael) and non-Hasidic rabbis (Degel HaTorah). It advocates increasing funding for Hasidic institutions and protecting religious traditions in the public sphere. UTJ currently has 5 members of the Knesset, and despite being part of the coalition government it has no Cabinet members. Leadership: UTJ is not led by any political leaders but instead by different rabbis who serve as spiritual leaders. Its two senior members are Yaakov Litzman of Agudath Yisrael, who serves as Deputy Health Minister, and Moshe Gafni of Degel HaTorah, who serves as Knesset Finance Committee Chairman, a role that allows influence over funding to ultra-Orthodox causes. Shas (Government): Another ultra-Orthodox party, Shas, primarily represents North African Jews which historically have faced discrimination and higher rates of poverty within Israel. It supports Judaism as a foundation for Israeli law and society, advocating military exemption and increased funding for yeshiva students, and promotes settlements in the West Bank. Despite a religious agenda, the party has many secular members. Shas has demonstrated some flexibility in the past has been part of left-wing, centrist and secular coalition governments. Shas currently holds 10 seats in the Knesset (11 before the split of MK Chaim Amsellem, who formed the new party Am Shalem). Leadership: Rabbi Ovadia Yosef serves as the spiritual leader of the party, while Eli Yishai, Aryeh Deri, and Ariel Atias serve as political leaders. Deri has returned to politics after a thirteen year hiatus following a conviction for bribery, and Rabbi Yosef announced the three politicians would serve together to prevent internal competition. Yair Lapid, leader of the Yesh Atid party, speaks to campaign volunteers in the southern city of Ashkelon a day before Tuesday’s parliamentary election. Photo by Amir Cohen/Reuters. Yesh Atid (New Party): A new party formed by prominent television journalist Yair Lapid, Yesh Atid seeks to represent the center of Israeli society — secular, middle class citizens. Its main goals include universal recruitment to the military (no exemptions for the ultra-Orthodox), reforming the electoral system, and creating a constitution. It supports “two states for two peoples” and would exchange land with the Palestinians to keep certain settlements in the West Bank. Leadership: Yair Lapid, former columnist and TV news anchor, achieved his popularity through his journalism career. The son of journalist and politician Josef “Tommy” Lapid (former head of liberal-secular Shinui party), Yair Lapid has also dabbled in variety of other professions. He’s been a boxer, movie actor and pop songwriter. Yesh Atid has done well in the polls and Yair Lapid’s brand as an “all-Israeli” type of guy endears him to the middle class. However, some critics have poked fun at his previous endeavors as a boxer and movie actor. Am Shalem (New Party): Am Shalem is centrist but religious, representing the segment of the ultra-Orthodox community which promotes integrating with more secular Israeli society in the workforce and military. It advocates mandatory national service for Haredi yeshiva students and general studies in ultra-Orthodox schools. Leadership: Chaim Amsellem, a rabbi, was thrown out of the Shas party two years ago for advocating a more liberal interpretation of rabbinical law than the conservative religious party. Kadima (Opposition): Kadima is a centrist party formed in 2005 to support former prime minister Ariel Sharon’s plan for disengagement from Gaza and further negotiations with the Palestinians. Its main interests are civilian, supporting a two-state solution that keeps Jerusalem and West Bank settlements for Israel. In the last Knesset, Kadima replaced leader Tzipi Livni with Shaul Mofaz, hoping to give the party new direction, but the party has declined in popularity and is not expected to make a strong showing in Tuesday’s election. Kadima won the most seats in the 2009 election but was unable to secure a coalition. Leadership: Shaul Mofaz is an Iranian-born politician who came to fame in Israel for his service in the military — holding the posts of defense minister and Israeli Defense Forces chief of the general staff. Many within Kadima hoped his takeover of the party leadership would infuse energy and further propel the group. That hasn’t happened. After becoming leader, Mofaz joined a coalition with Netanyahu which lasted only 70 days. Since then, Kadima has been dropping in the polls. Mofaz faces the added challenge of competing for centrist votes against his former party rival — Tzipi Livni — who formed her own party after losing Kadima’s leadership. 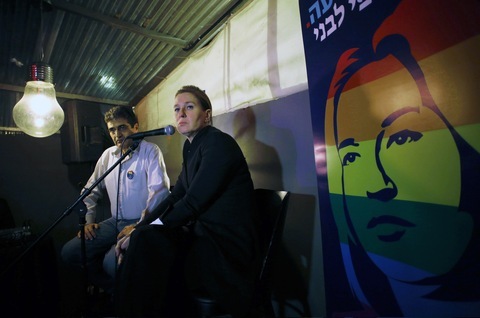 Tzipi Livni, former foreign minister and head of Hatnuah centrist party, campaigns in a club in Tel Aviv. Photo by Baz Ratner/Reuters. Hatnuah (Opposition): Billed as an alternative centrist party, Hatnuah aims to rehabilitate Israel’s international standing and revive the peace process with the Palestinian Authority. Hatnuah is a breakaway party made up primarily of Labor and Kadima members. Leadership: Tzipi Livni, a former Kadima MK who has served as foreign minister. Livni, who claims to be the only centrist candidate willing to put negotiating with the Palestinian Authority on the top of her agenda, has drawn fire from critics who claim she has further fragmented the centrist movement by creating another party after she lost the Kadima party leadership to Shaul Mofaz. Meretz (Opposition): Meretz is a leftist party that runs on a platform of social welfare, a secular and democratic Israel and opposition to Israel’s control over the West Bank and Gaza. Meretz won a mere three seats in the current Knesset, down from a high of 12 in 1992. It is the only Zionist party that opposed Israel’s recent military action in Gaza. It’s also the only left of Likud Zionist party that has absolutely refused to enter into a Likud/Israel Beiteinu coalition. Leadership: Zehava Gal-on, a founding member of B’Tselem (The Israeli Information Center for Human Rights in the Occupied Territories), did not become a member of the the current Knesset until previous Meretz leader Haim Oron resigned in March 2011. Gal-on won her party’s leadership in February 2012 and vowed to make Meretz make “sharp and chutzpahdik.” Meretz, under Gal-on, seems likely to improve its fortune this election. If the latest major polls are correct, the party would double its number of Knesset seats, from three to six. 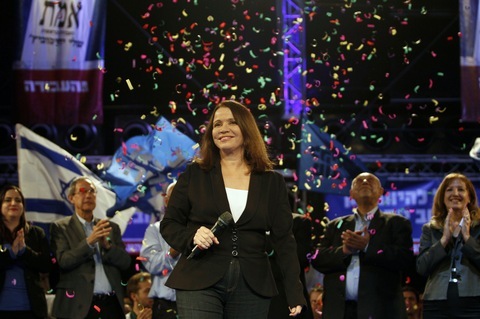 Labor party leader Shelly Yachimovich at a Tel Aviv campaign rally. Photo by Baz Ratner/Reuters. Labor (Opposition): A former dominant party of Israel — serving as either the leadership government or main opposition — the left of center group has been struggling since 2001. The decline has been blamed on inept and short-lived leadership, the failure of the Oslo accords and the departure of many of its members to the centrist Kadima party. Labor has been focused primarily this election on domestic economic and social issues. The party, led by Shelly Yacimovich, is gaining ground in the polls and appear to be on target for a second place finish behind Likud/Yisrael Beiteinu. Leadership: Former journalist Shelly Yacimovich rose to power in the party after the departure of Ehud Barak, attracting support from young Israelis who participated in the 2011 social street protests. Yacimovich’s decision to focus the party’s attention on domestic and social issues and not on the peace process has led to some defections in the party. Yacimovich has indicated that she would be willing to enter into a coalition government with Likud/Yisrael Beiteinu and others. It’s expected that some of her fellow party members will try to prevent that from happening. Leadership: Mohammed Barakeh, who has served in the Knesset for 13 years. Balad (Opposition): A secular-left party, Balad has roots in the pan-Arabism movement. It promotes strict separation of the state and religion and opposes Arab Islamic parties within Israel. Leadership: Balad’s most prominent leader is Hanin Zuabi, the first female MK from an Arab party who gained notoriety for participating in a flotilla to Gaza. Its other head is Jamal Zahalka. United Arab List/Ta’al (Opposition): The United Arab List is the most religious of parties representing Arab citizens of Israel, advocating for religious law (Sharia). Along with Ta’al, it supports the formation of a Palestinian state in the West Bank and Gaza and fights for civil rights of Arabs in Israel. It currently holds four seats in the Knesset. Previously, Ta’al had aligned itself with other Arab parties. Leadership: Ibrahim Sarsur and Ahmed Tibi, a former advisor to Yassir Arafat and perhaps one of the most famous Arab politicians in Israel. Otzma LeyIsrael (Opposition): Hard right party which opposes ceding land to the Palestinian Authority and advocates expanding the Jewish state to include the West Bank and Gaza. The group, which includes many right-wing settlers — has indicated a desire to “take care” of Israeli Arabs and foreign workers. If the party returns to the Knesset, it is not expected to join any coalition. Leadership: Michael Ben-Ari and Aryeh Eldad broke away from the National Union party to create the most right-wing party Israel’s Knesset. The leaders have come under fire for inflammatory statements towards refugees, Palestinians and Israeli leftists. Eldad, is a former chief medical officer of the Israeli Defense Forces. The Knesset has the power to extend its own term, which is done by a special majority. This happened once, in 1973, when elections to the 8th Knesset were delayed due to the Yom Kippur war. Senior military members must wait three years after their departure from military service before entering civilian politics under a 2007 “cooling-off” law. Military service is compulsory in Israel, with male citizens serving three years and female citizens serving two, although there are exemptions for Arabs and Druze women (Druze men are required to service) and reasons regarding religion, living abroad, parenthood, and conscientious objection. Parliamentary election campaigns use public funding, which is given proportionally to parties based on the number of seats it has in the Knesset. New parties are at a disadvantage since they are only given a small sum. All private funding must be declared, and there are limits on individual, group, and international donations. Israel has no formal constitution — the Justice Committee of the Knesset has been drafting one, but generally the Supreme Court follows rulings from laws passed by the parliament.